10Bet’s new Add to Bet feature is similar to ‘Edit My Acca’ style features that you might have encountered elsewhere. It’s not the same as that, obviously, as that would just be Edit My Acca, but it’s the best way of describing it without simply telling you all of the feature’s intricacies. It’s another example of a company realising that existing features can be tweaked and changed in order to maximise their potential and keep customers coming back time and again. The best bookies come up with new and interesting ways for punters to place their wagers, but they also re-invent systems and features that are already in use in order to make them that little bit more user friendly and fun to play. That’s what the same company’s Pulse Betting feature has done, taking the idea of In-Play markets and giving it a twist to make things interesting. They’re leading the way in terms of relatively new bookmakers who are keeping themselves modern, as you’ll discover on this page. The idea behind Add to Bet is actually really simple. The name tells you everything that you need to know, but in essence what you’re being presented with is the opportunity to add legs to a bet that you’ve already placed, turning it from a Single into an Acca or adding more legs to an Acca you’ve already got going on. The reason it’s so interesting is that it used the stake from your first bet and transfers it to your new bet, meaning that you don’t actually have to spend any money on this new wager. Let’s break it down a little more simplistically. You’ve placed a £1 Single on Liverpool to beat Manchester United in the Premier League. The odds are 7/1, with the game poised at 0-0 at half-time. Meanwhile the team news for Chelsea v Spurs and West Ham against Brighton has been released and you’ve noticed that both Chelsea and West Ham have weakened teams. Liverpool have looked the stronger of the two sides in the early kick-off, so you’re still confident that your bet is going to be a winner. You’ve decided, however, that you’d now like it to be an accumulator with wagers on Spurs and Brighton added to the mix. Rather than having to place a whole new bet on Spurs and Brighton to Win, you can add them to your Liverpool bet. 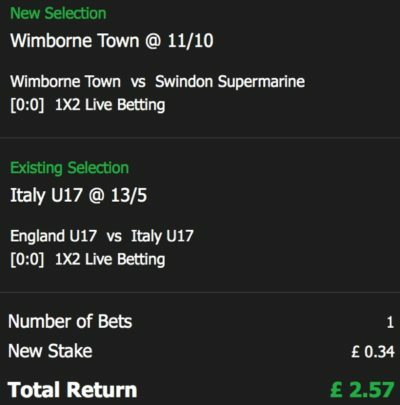 In the example here, I’ve placed a modest bet of 50p on England U17s to lose against Italy U17s, so I’m essentially being offered 34p to Cash Out that bet and then place it on a Double of Italy U17s and Wimborne Town both winning. The return I’ll get if that comes off is £2.57, so a decent improvement on 34p! One thing worth mentioning here is that you’ll only have to lose a significant chunk of money on the Cash Out if you opt to place In-Play bets and then Add to Bet. If you do it ante-post then you’ll find the Cash Out offer is much more reasonable, in some cases actually being level with the amount of money you bet in the first place. That’s because odds shift all of the time once an event is underway, meaning that you can sometimes see your Cash Out offer drop significantly if it’s felt that there’s no value in it for the bookmaker. With ante-post bets, on the other hand, there’s less movement in the market, especially if you’re doing it well in advance of kick-off and therefore there’s no team news or injury problems that are likely to affect the outcome. Even so, the Cash Out value might be less by around ten percent of the original bet, which is a significant amount of money if you’re placing quite large wagers in the first place. The question that you’ve really got to ask yourself here revolves around the notion of there being any value in using the Add to Bet feature rather than just placing a new bet. Part of the answer to that question involves understanding how bookmakers work in the first place. Let’s have a think about a made up scenario. We already know that bookies build margins into the odds that they offer. Let’s say that you’re betting on Everton to beat Stoke City and the real odds of that occurring are 4/1. A bookmaker will offer you 2/1, meaning that they’re essentially ‘keeping’ £2 for every £1 you bet if your wager is a winner. If you then decide to Add to Bet with a game involving Chester and Norwich, then you’re essentially allowing the bookie to take two margins rather than the initial one. You can’t blame the bookmakers, of course. At the end of the day they’re running a business rather than a not for profit organisation. 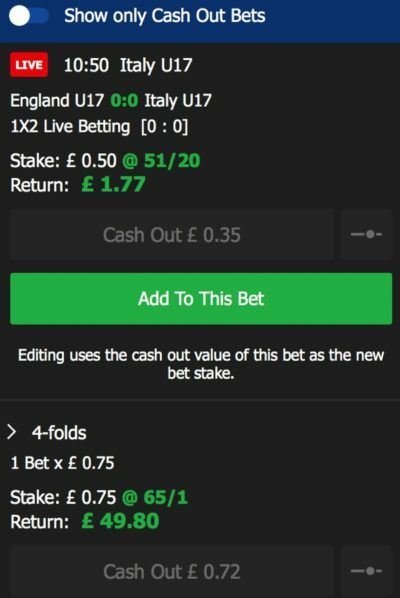 Allowing the likes of Cash Out and Add to Bet features increases the risk for bookies, so the only way for them to mitigate that risk is by building in profit where possible. The trick isn’t in trying to find bets where bookmakers don’t make any money – they don’t really exist – it’s in accepting that they’re going to and weighing up whether it’s worth losing a little bit of profit in the short-term in order to make more money in the long-term. The reality is that you should only really use the Add to Bet feature from 10Bet on an irregular basis. Limiting the amount of times that you have to Cash Out a bet in order to place a new one will limit the number of ways that you lose an edge to the bookmaker. It will also encourage you to think harder about your bets before placing them in order to maximise the amount of money you’ll win against the amount that you’ll lose. In terms of purely how much money you’ll be able to win by using Add to Bet, let’s look at a specific example. 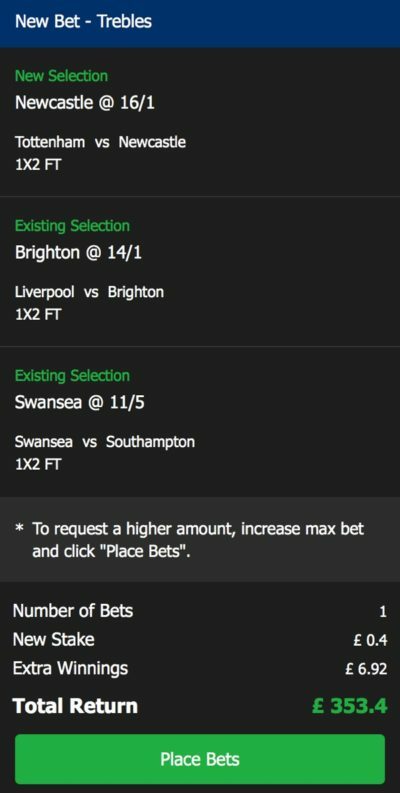 Imagine that you’ve placed a 45p Double on Swansea to beat Southampton and Liverpool to lose at home to Brighton. The payout will be £21.96 if it wins, but you’ve decided that you’d also like to bet on Newcastle to beat Spurs. If you place that as a 50p single, you’ll have wagered 95p for a possible £30.83 return in total, given that you’d get £8.87 from the Newcastle win. 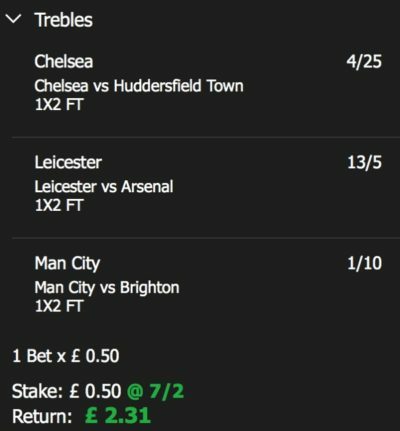 If, on the other hand, you choose to turn your Double into a Treble then you won’t have to place a new bet, instead simply Cashing Out the Double at a cost of 5p in order to place a new bet of 40p on the Treble. In this instance, that would see a return of £353.40 because of the unlikely nature of all three events occurring. Adding in Manchester United to Win @ 4/25 changes the bet to see a possible return of £2.42, but costs you 5p in the Cash Out process. That means that you’re increasing your possible return by 6p once you’ve taken that into account. The obvious question that you need to ask is: Is it worth it? The reason that accumulators so often have such long odds is that the possibility of every single leg coming home is slim. With every one that you add to your betting slip, you’re increasing the chances of your bet being a losing one. Is it worth adding another cog to the machine for the sake of an increase in winnings of 6 pence? Ok, I’ve deliberately used small stakes here for the purposes of ease of explanation, but even if you increase the stakes dramatically you’re still seeing a relatively modest return for your wager, comparatively speaking. With al of that in mind, then, when’s the best time to use a feature such as ‘Add to Bet’? The most obvious answer is when you’re as close to certain as it’s possible to be that your wager is going to be a winner. Ultimately it doesn’t matter if you’re losing a chunk of your original stake during the Cash Out period if your bet is a winner, given that you get it back in the end anyway. Yet how often can we feel that confident about a bet? Believe it or not, it’s actually quite rare for all of the favourites to win over the same weekend in football. Another occasion in which you might want to consider using Add to Bet is when you’ve forgotten to add a leg to an accumulator you’ve spent all week thinking about. As you’ll know if you’ve read other pieces on this site, I’m a massive believer in the importance of research. Whether that involves going in-depth on the stats of both teams taking part in a match to present yourself with the best possible knowledge of likely outcomes or it involves looking on club fan forums to find out the gossip about a player not starting because he’s had an argument with the manager, being forewarned is being forearmed. If you’ve spent the past five days doing a deep dive on stats and have come up with a killer Acca that you’re convinced will be a winner because the numbers say as much but you accidentally forgot to add one of the legs to your selection, then that’s the perfect time to Add to Bet and put your mind at ease. After all, there’s no point in researching things to the hilt only to then mess up at the final moment. You can read that feeling smug with yourself but let’s be honest, it’s happened to the best of us. 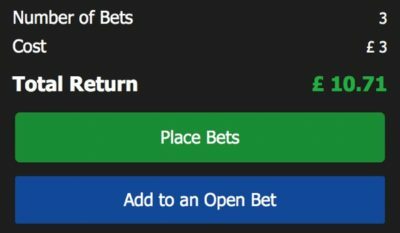 I’ve told you about the fact that using the Add to Bet feature Cashes Out your first bet and then uses the profit to place the new bet, so we don’t need to go over that again. One thing that is worth bearing in mind, however, is that some promotions don’t allow you to use Cash Out function. Despite having a different name, Add to Bet is a form of Cash Out and you’ll therefore be at risk of losing a promotional offer if you take advantage of Add to Bet with a wager placed using promotional money. Let’s say that you’ve been on the end of an offer that says they’ll match your deposit if you turn it over once. You place your initial bet, using up your deposit money of £25. After placing the bet you realise that you forgot to add a leg to your Acca, meaning that you decide to Add to Bet the leg that you left out. That Cashes Out the original £25, but your new bet goes on to be a winner. You’ve collected the £345 that you won and expect to see a £25 bonus fund in your account but it’s not there. That’s because the use of the Add to Bet feature acted as a Cash Out and in turn invalidated your offer. The vast majority of Free Bet, Welcome and Sign Up offers have the Cash Out clause in them, so if you want to be sensible then you’re best off avoiding using the feature altogether if you’re taking advantage of a bonus. As always with such things, if you read the small print before hand then you’ll know exactly what to expect in terms of what will happen if you do certain things. That very much falls into my category of ‘Do Your Research’ and really should become your watchword for all of your betting exploits. Add to Bet is a feature with flaws, but used correctly it can see you make a decent profit.